Turnkey renovation of multibrand store in top location in Amsterdam. Should be a warm welcome to both local and international clients. 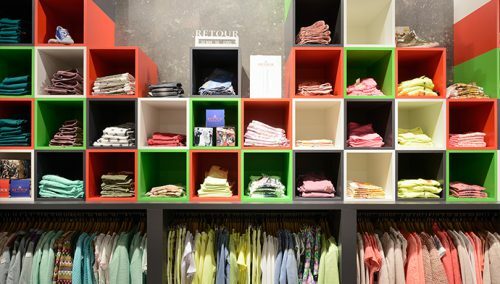 The store offers a stage decor for top brands such as Colmar, CP Company, John Varvatos, Peutery, Kenzo. Integration of accessories such as shoes, jewellery and deluxe perfumes is a must. Challenging building due to its L-shape and the presence of various columns. Creating a presentation island with integrated bar and counter is the routing with a perfect overview. Striking integration of various ambiances by combining materials such as black stained oak, gold/rust coloured steel, glossy black spraypaint work and ice-white plaster.